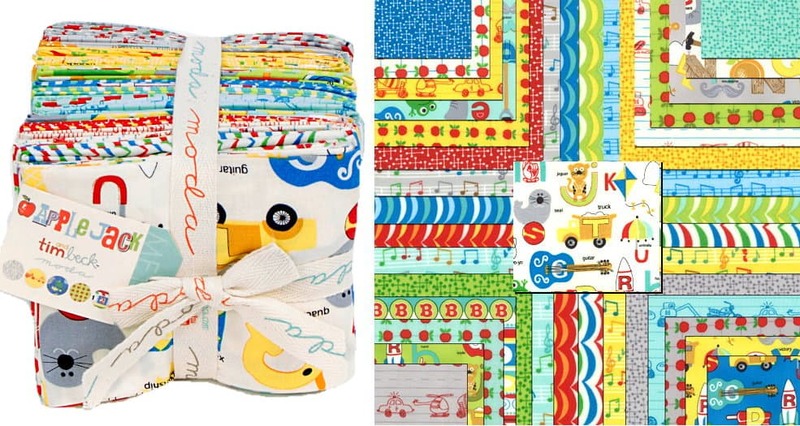 Get ready to join a circus of elementary learning made spectacular!…..
Apple Jack Fat Quarter Bundle by Tim and Beck for Moda fabrics. This bundle contains 33 fat quarters (18″x 22″). Fabric is all new, 100% premium quality Moda cotton. See photos of entire fabric collection above. More in this collection available in our store while supplies last. Use store search engine to find. Collection Description: Get ready to join a circus of elementary learning made spectacular! Take part in our nostalgic parade of whimsical letters, darling little pals, and all the fun, complementary designs you could ask for to create to your hearts desire. Bright, primary colors pop playfully and a smattering of flannel prints are perfect for the little ones to cuddle up with.